I’ve been home from Spain for a week, and my pack has been sitting at the end of the bed, half-unpacked. Today I began to put it away in the garage. But wait! I know you’ve been dying to know what was in it. So I’ll give you a tour. 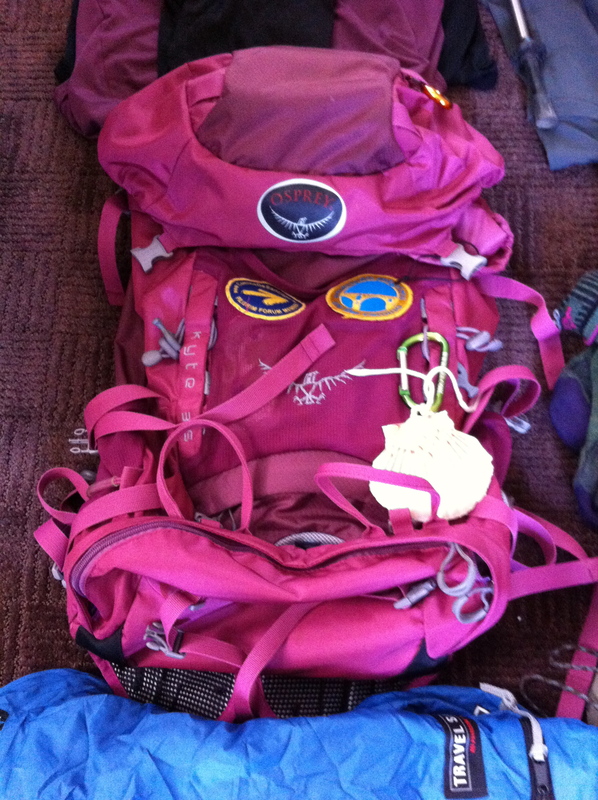 The pack is an Osprey Kyte Woman’s S/M, 36 liters. You can see my Pilgrim’s Shell and my patches for American Pilgrims on the Camino and the Pilgrim Network. 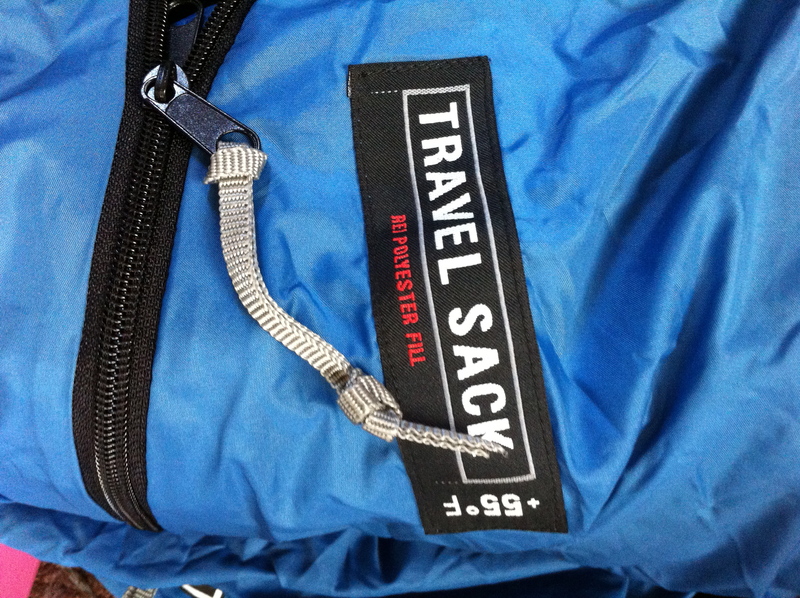 One of the most valuable features of the pack was its waterproof rain cover. It’s integrated into the pack, and completely covers it, then stuffs back into its own compartment when not needed. It’s something that I’d probably never use in California, but I used it a lot on the Camino. Best of all, it kept the body of the pack very dry. The straps did get wet. But it was only on my last day when the rain was pouring for hours that the pack itself eventually got soaked. My sleeping bag lived at the bottom of the pack. It was one of the best items on board. I was really glad I had it towards the end of October, when the heat was not turned on in many places I stayed in Galicia. It was also very comfortable when I was on the beginning of the Camino in June. It weighs less than l lb. BTW, it has arm holes so you can wear it around the house! 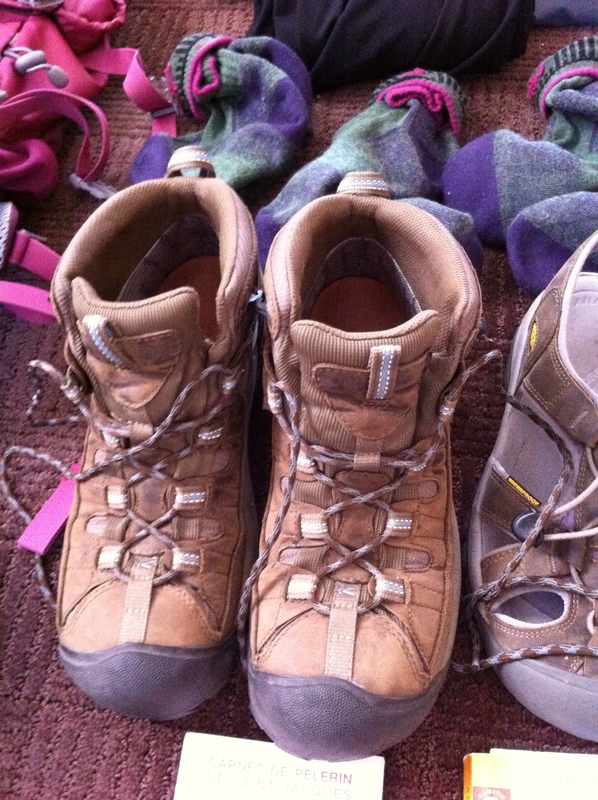 On one of my many trips to REI in September, I bought a new pair of boots. Beware, you’re supposed to break in your boots over a course of months—but these Keen Targhee boots were the best—terrific toe room, and they were comfortable from day one. I only got one itty bitty blister the first day out, and that was it. To top it off, they’re waterproof! Above the boots you can see my three pairs of Darn Tough wool socks from Vermont. I decided to take three pairs so that I wouldn’t have to do as much laundry, and I was glad I did. It felt luxurious. Next to the boots are my Keen sandals. I brought these in June, and they were fine in October, too. Many people brought Crocs or flip-flops, which are a lot lighter, but I like my Keens, they protect my toes. It rains a lot in Galicia, and I’m so glad I invested in some real rain gear. 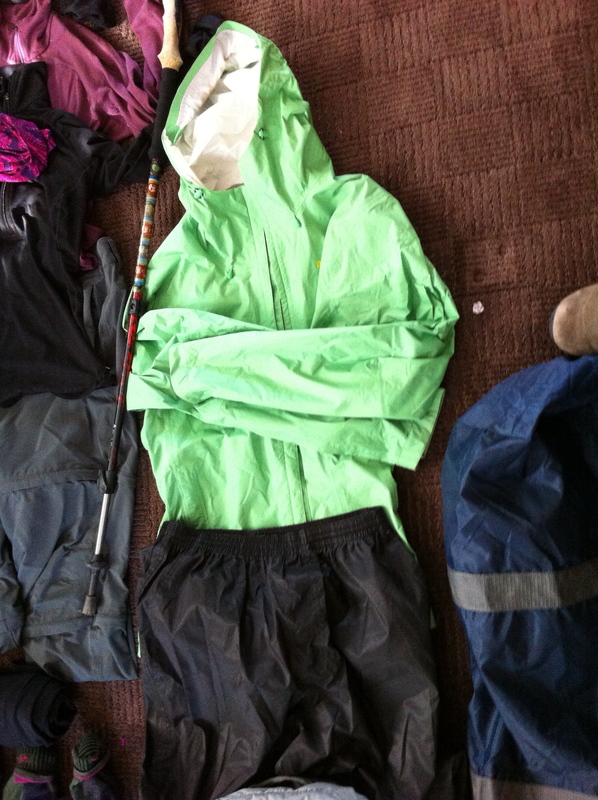 The Patagonia Torrent rain shell kept me fairly dry even in the most wet conditions. It was amazing! The rain pants kept me dry, but didn’t breath as much. Together with the rain cover on the pack, I felt confident walking in the rain. And it turned out to be fun! When I walked in June I expected to carry my pack every day. Then I discovered Jacotrans, and other services that, for a small fee, will transport your pack to a destination you designate, farther along the Camino. In October, I brought a small, lightweight daypack with me so that I could use the transport service more easily. Even with the transport service, you want to carry your guidebook, water, and whatever else. 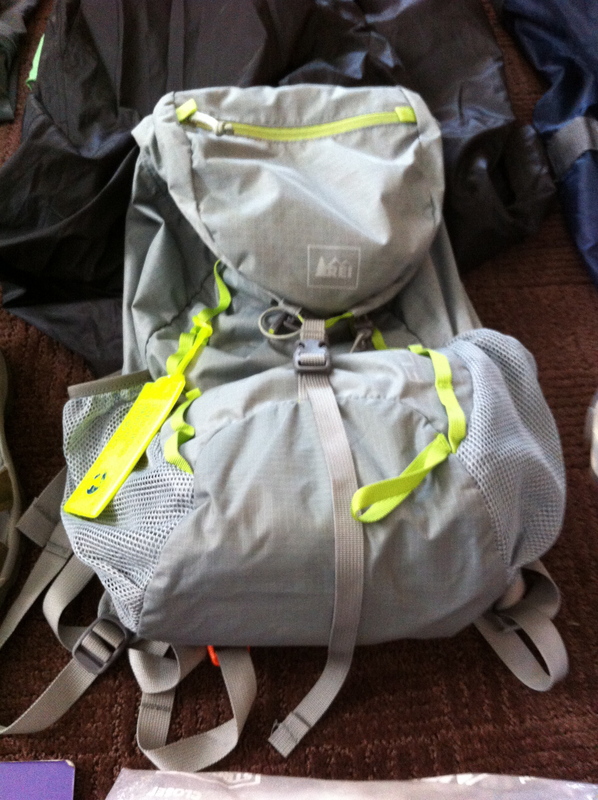 I liked how this pack had big cargo pockets on the side for my guidebook and water bottle. With the wet weather, I ended up off-loading heavier items to the daypack, and carrying my Osprey pack because it had the rain cover. In an case, I would recommend using the pack transport services. There are days when the terrain is rough, or you just feel like having a lighter load. For between 3 and 7 Euros a day, it’s a great deal! 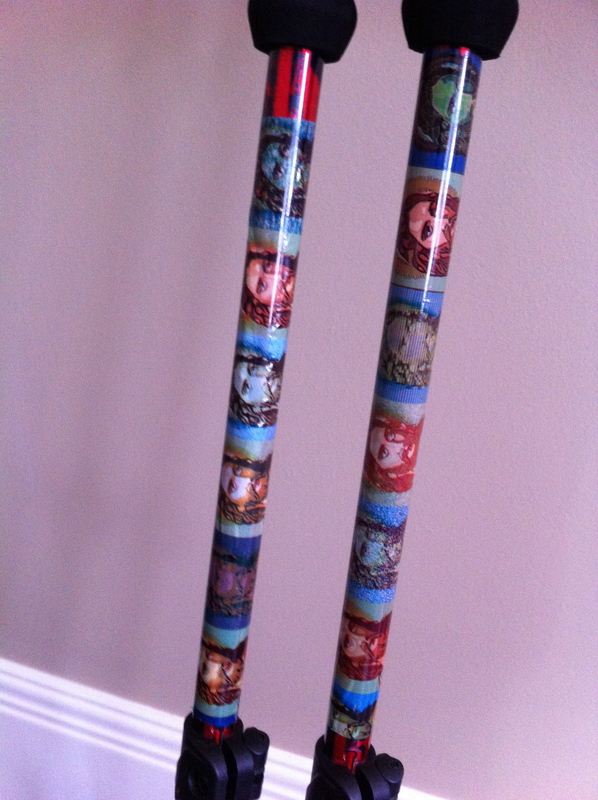 Here are my “Jesus poles.” I used these Black Diamond trekking poles everyday. They were great for stability in muddy conditions, going uphill, and especially going downhill on rocks, and slippery terrain. It took me awhile to realize that there is a left and a right pole, and there’s a correct way to use them. The straps are there so you can put weight on the poles. I’ll show you a close-up of the Jesus tape on them. My colleague at Trinity, Menlo Park applied the Jesus tape, and I often thought of how Jesus really was walking with me every step of the way. 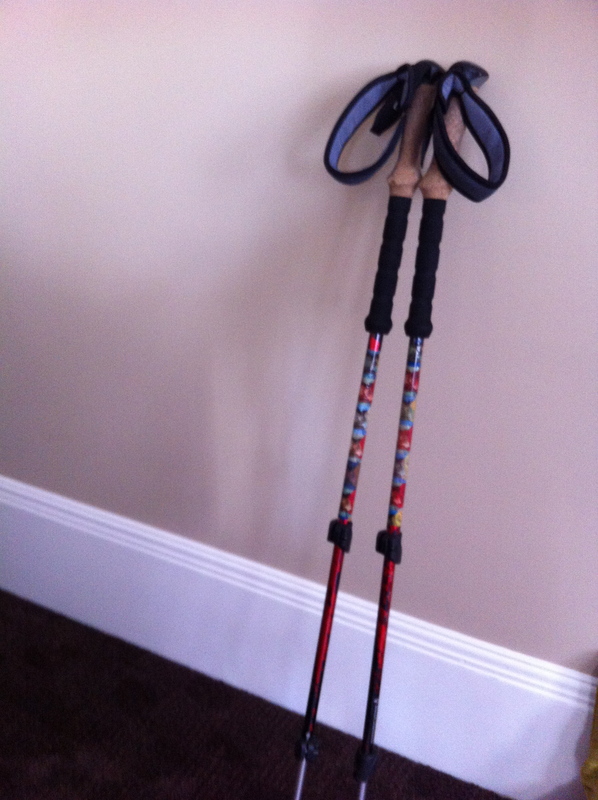 Trekking poles cannot go on board an airplane, and mine don’t collapse down to fit into the pack. So I had to come up with a creative solution. 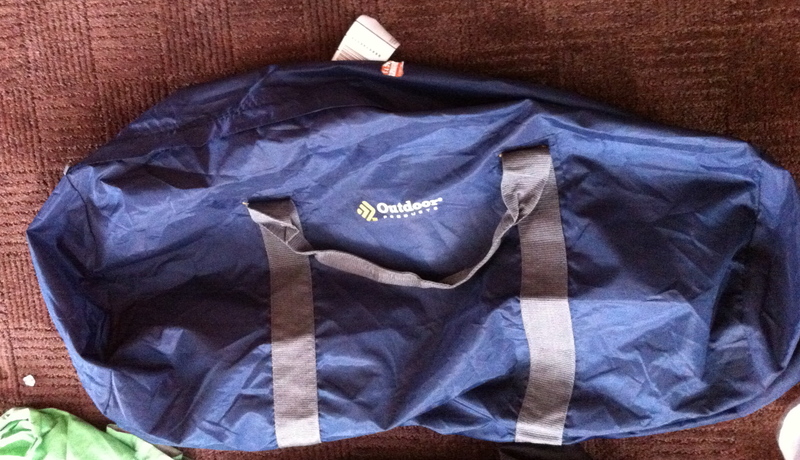 The night before I left, I went to Big 5 and bought this lightweight duffel bag. I checked the pack and the poles together in it. I thought about mailing it to myself in Santiago, but ended up just carrying it the whole way. No big deal. In June, I swore by my Camelbak type 2-liter water system. Hydration is critical when you’re walking a half-marathon a day. 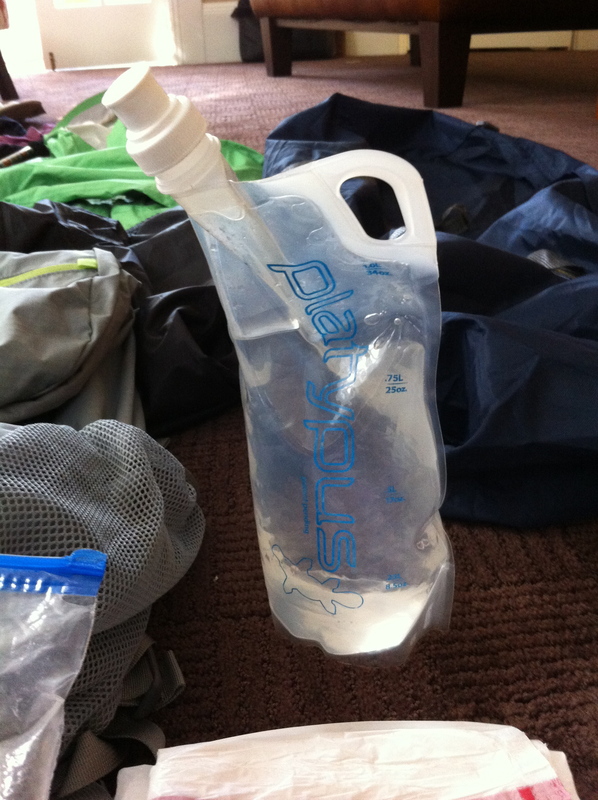 Goldhara McKay, a fellow pilgrim, recommended this kind of collapsible water bottle on the American Pilgrims on the Camino Facebook page, and I decided to try it instead of the Camelbak type system. I started out with two of them, but left one at the Molinaseca albergue—I hope someone is using it right now. They’re terrific! When empty, you can curl it up into a pocket, and it weighs nothing. What to wear everywhere. Who knew that REI was such a fashion house? Add a black or vino tinto colored T-shirt, a Merino wool half-zip, and a Buff or the Camino scarf, and you’ve got an outfit. Was there anything I wish I’d left behind? Yes, my zip lock bag of toiletries, which seemed to weigh a ton. Somehow I collected full size containers of shampoo, toothpaste, and moisturizer, plus foot care supplies like foot cream and blister care items. But I was glad I had my BB Cream, blush and lipstick to dress it up a bit each morning. Thanks for cluing in all of us vicarious Perigrinas on what a modern, well-equipped & well-dressed Camino-ist needs! Great to get a peak inside the mysteries of the pack. I think that alot of this is useful info for the average day-hiker like me. For instance, last month when I was day-hiking in Mammoth for a week I discovered that my daypack really doesn’t fit me very well. I made a point of noticing what other hikers were toting and guess what, there were loads of Osprey packs. Now that I have your endorsement of Osprey, I’m going shopping! Have fun trying on the Ospreys. They have lots of good smaller ones. Having a good hip strap makes all the difference in the world. 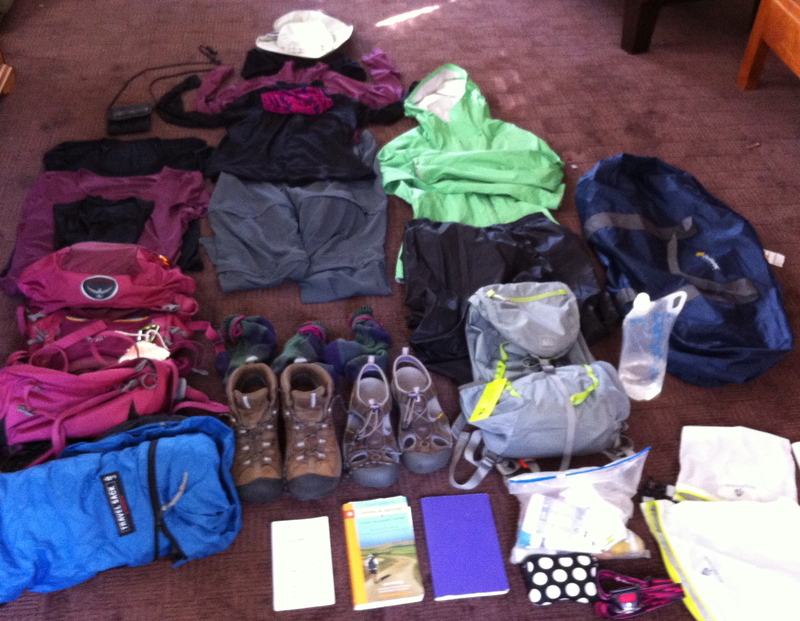 Many day packs are more like book bags, I think. 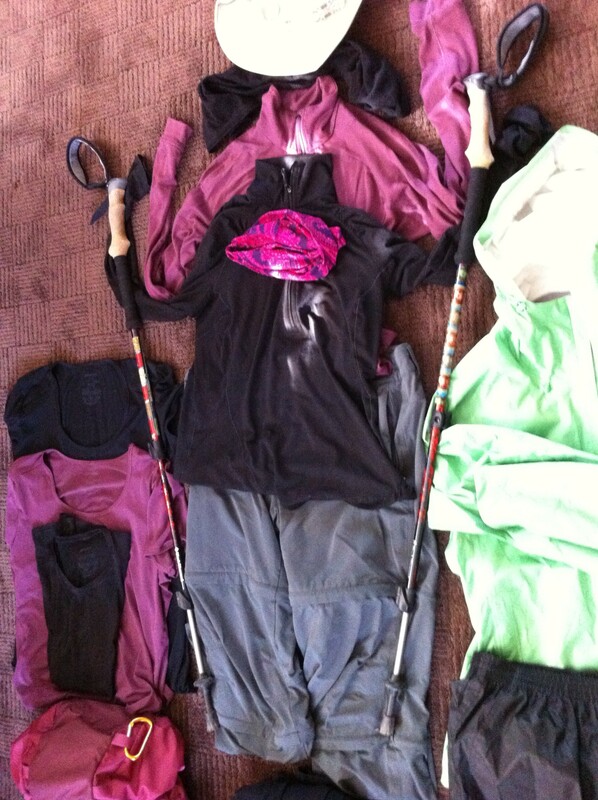 I often felt like Mary Poppins when she packs her magic carpetbag—is it going to all fit? ?